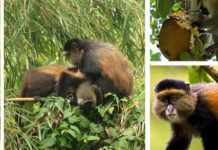 Kibale Forest National Park offers an outstanding environment for Primate trekking and bird watching. With an area of 560 square kilometers, Kibale is a habitat to notable 13 primate species, including the much localized red colobus and L’Hoest’s monkeys. Kibale forest major attention-grabbing activity is the tracking of habituated chimpanzees (1,450 chimpanzees registered). Naturally, chimpanzees are very much interrelated to humans than to any other living creatures and they are admirable to watch as they fall out and engage in amusement in the rich vegetation. A column of trails sheltered by the forest provides much enjoyment to botanists and butterfly lovers, while bird watchers are in for satisfaction with 335 species recorded including the common Prirogrine’s ground thrush. There are also 4 species recorded nowhere else in Ugandan national parks: Nahan’s Francolin, blue-headed bee-eater, masked Apalis, and Cassin’s Spinetail. Other bird species are the Red-winged Francolin, White-naped pigeon, Green-breasted Pitta, Abyssinian Ground Thrush, White-bellied Fly-catcher, Red-chested Flufftail, Uganda woodland Warbler, Chestnut-winged Starling, Tiny Sunbirds, Joyful Greenbul, Petit’s Cuckoo-Shrike, Grey-winged Robin, and Grey-headed Olive-back. Kibale Forest acquired the National Park status in 1993 and has at least 60 registered mammal species. 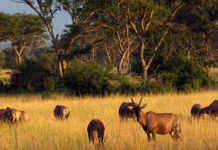 Among these consist of elephants, buffaloes, bushpigs, duikers and bats. The nine diurnal primates present in Kibale Forest include vervet, black and white colobus, vervet monkeys, olive baboon, and chimpanzees. The elusive forest elephant, smaller and hairier than its savannah counterpart, moves seasonally into the developed part of the park, while other worldly animals like the buffalo, giant forest hog and a half dozen antelope species. Kibale is mainly occupied by Batooro and Bakiga who habitually use the forest for food, fuel, building materials and medicines. The main stimulating tourist activities are available at Kanyanchu River Camp. Here tour guides who are knowledgeable with information about elephants, reptiles, butterflies, amphibians, elephants, chimpanzees, medicinal plants plus many fauna and floras are gladly available to share it with anyone paying attention. Tourists stride from Kanyanchu River Camp in the morning at 8.00 am or afternoon at 3.00 pm. It’s an exciting walk that lasts between 2 – 4 hours. This primate walk enables you to spot a different plant and animal species in the forest. Four groups of four visitors are entertainment in the morning and similar group sizes in the afternoon. This activity focuses on de-sensitizing chimpanzees to human presence while maintaining their natural behavior. During habituation process, one sees chimps getting-out of the nests between 5.30 am and 6.30 am and keeps follow-up to when building nests for their sleeping between 6.30 pm and 7.30 pm in the evening. Habituation starts from Kanyanchu River Camp. The walking of 12 km is made only during the dry seasons, that from November to February and June to September and gives a visiting opportunity to the diverse park sanctuaries like the tropical rain forest, grassland, swamp and riverine forest. Walking by and large starts at 8.00 am up to when elephant wallow around 2.00 pm. This hiking exposes primates and birds you to many. Taking packed lunch is good for this hike. 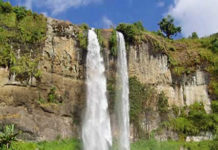 Persons who want adventuring and significantly get pleasure from the Forest’s wildlife, a 63 km guide walk from either Sebitoli or Kanyanchu and end at either site as you walk for 2 – 6 days through various sanctuaries and community campsites at Nyakarongo, Nyaibanda and Kinoni where you will enjoy the traditional dance and offered local food dishes is reasonably worthwhile. 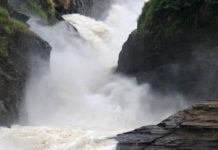 Ideal time for visiting Kibale National Park. One can visit the park during any time of the year. 1. Primate Lodge Kibale – located in the middle of the forest at where the chimp tracking commences from, it has charming restaurant, bar and fire place for pleasant evenings. Preparations for modern bandas, luxury tents and a comfortable Sky Tree House are underway. 2. Kanyanchu River Camp- excellent accommodation for visitors who stay in the Sky Tree House overlooking the spectacular elephant wallow. The Sky Tree House accommodates 2 people only. 3. Sebitoli Forest Centre – this one has a capacity of 11 beds (2 doubles, 3 singles and 2 twins). 4. 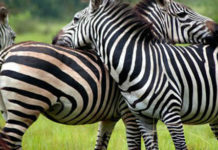 Mantana Luxury Tented Camp – in the middle of the forest, it’s a bush type comfortable accommodation. 5. Ndali Lodge – a luxury accommodation with thatched cottages overlooking a crater lake. 6. Budget lodges at Bigodi, the crater lakes; an observation tower and a boardwalk that traverses the papyrus beds. The path and boardwalk may be flooded and muddy after heavy rain and gumboots are recommended. They can be hired at the visitor centre. The walk is about 4 km in length, taking 3-4 hours at birding pace. With all proceeds from eco-tourism going back into the community, this is a conservation project well worth supporting. Drive from Kampala to Fort Portal (320kms) then take a road to Kamwenge that commences from near the bridge over the Mpanga River in Fort Portal and is well signposted. Drive turning to left at the junction 12 km from Fort Portal and read the signpost for another 24 km drive to Kanyanchu Tourist Centre. 1. Please note that this is not a Zoo so it is a tropical rainforest and sightings depend on factors such as time of the day fruit availability, weather and how quite the primate group is. 4. 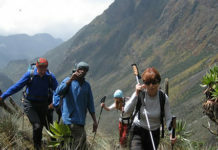 When trekking, you are advised to remain in a tight group and follow the guides directions at all times. 6. Under no circumstance shall you chase while they descend or to or walk on higher ground. 10. It’s advisable to wear long boots that cover your toes and long trousers as there are red ants and slippery trails, also carry along water proof clothing in the rainy season. 11. Children under 15 years are not allowed to view the chimps for safety reasons. 12. If you need to urinate please do so off the trail system. 13. If you need to defecate, please do so off the trail system and bury all in the hole all waste.